HALLETS POINT — The first boats on the new Astoria ferry route launched Tuesday morning — the fourth line to open as part of the NYC Ferry system, which has served more than 1.5 million riders since its launch at the start of May, city officials said. The Astoria line shuttles residents from the Hallets Point peninsula to a new landing at Gantry Plaza State Park in Long Island City, then to Roosevelt Island, East 34th Street and finally Wall Street — a trip that takes approximately 47 minutes, with boats running every 25 minutes during rush hours. It joins three NYC Ferry routes already in operation: the Rockaway, South Brooklyn and East River lines. Two more routes — connecting riders on the Lower East Side and the Soundview section of The Bronx — are slated to start next summer. "It’s a new way for people to get around, and we’ve got to take advantage of it," Mayor Bill de Blasio said at a press conference marking the launch of the Astoria route. "Our streets are too crowded, our subways are too crowded, [but] our waterways are nice and open, and so that’s why we knew we had to get back to the water." Astoria's ferry landing is located at 3-10 Astoria Blvd. adjacent to NYCHA's Astoria Houses, where riders can get to the east side of Manhattan in 29 minutes. Locals say the service is needed along Astoria's waterfront, where the N/W subway line is about a 20 minute-walk away. "It's exciting," said Claudia Colger, president of the Astoria Houses Residents' Association. "It makes it much more accessible to get to the city, even to Downtown Manhattan and Brooklyn." NYC Ferry has proved popular since its opening, hitting the one million rider mark in July, a month earlier than initially projected. 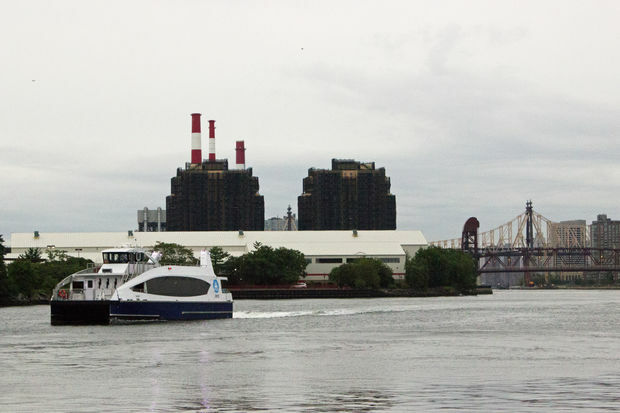 High demand for the ferry led to complaints from riders this summer about less reliable service on the East River route, as well as long lines for beach-goers using the Rockaway route. City officials, however, say riders are happy with the service, citing its own recent survey that found 93 percent of respondents are satisfied with NYC Ferry. The ferry costs $2.75 and allows a free transfer upon request to other NYC Ferry routes. However, there are no free transfers to the MTA's subways or buses. Deborah Drucker, a Roosevelt Island resident for nearly four decades, rode the first boat on the Astoria route Tuesday and said she was excited to make the ferry part of her regular commute. "It's great because the subways are very crowded in the morning," she said. "It's just a pleasure."